The Orchard Hospital was built as an 800 bedded temporary hospital in 1901/2, along with Long Reach to cope with the smallpox epidemic at the time. The number of beds available on the ships was proving insufficient and no one wanted a smallpox hospital in their town! The Metropolitan Asylum Board (MAB) already owned the land and patients were easily transported from London by the River Ambulances. The cost of building the hospital was £135,359. The Orchard was furnished with surplus furniture from Gore Farm Hospital and opened with Dr Rundles as temporary Medical Superintendent (MS); he was also to cover for Dr Ricketts (MS of the ships and Long Reach) during Annual Leave. Matron was Miss E M Bann from the Brook Hospital and she was to return to the Brook when she wasn’t needed at the Orchard. When Joyce Green Hospital opened in 1903, the combined bed total of Long Reach, The Orchard and Joyce Green meant that there was an adequate number of beds available for smallpox and so the Hospital Ships, which were now in poor condition, were scrapped. After 1910 Long Reach was kept permanently in reserve for smallpox. It was apparent that in years of low incidence of smallpox there was high incidence of scarlet fever. The Orchard and Joyce Green hospitals, therefore, were turned to fever hospitals when there was little smallpox. The Orchard spent much of its time closed and was only opened for major epidemics. The Orchard was turned over to the military during the First World War. It became the Dartford Australian Auxiliary Hospital on the 9th October 1916, under the command of Lieutenant-Col. H Arthur Powell. 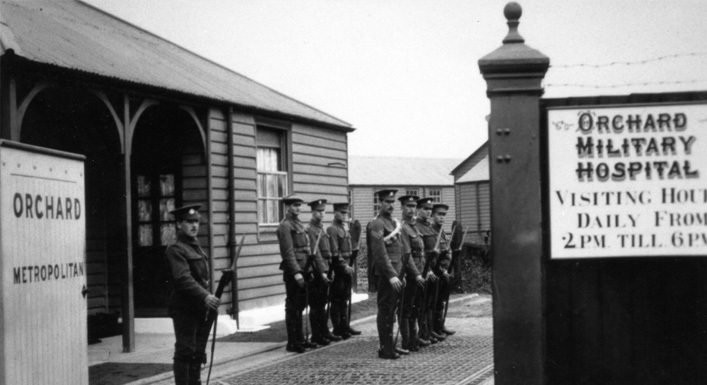 In a newsletter written by the soldiers, their arrival at The Orchard was described like this: “There was nothing particularly inviting about the trip from the railway station to the gates. The country looked dark and bleak, nothing that could suggest a happy hunting ground after nature’s bounteous gifts, yet those weary travellers hailed it at last as their haven of rest. A word and a glance were all that passed during the dreary march from the station to the Hospital (a distance of two miles). Over the two years to 1919 considerable improvements were made. The most notable was to the grounds and gardens, cookhouse, headquarters and the addition of an operating theatre. There was an efficient boiler house supplying steam to drive the engine to supply heat for the laundry to dry clothes and to provide hot water for all the wards (and was also used for heating). The lighting was provided by gas, each ward having a liberal number of jets. As the hospital advanced, its capacity increased from 1,000 to 1,200. This change meant additional staff were required and on the recommendation of Lieut. Col. B M Sutherland, 110 Women’s Army Auxiliary Corps members found work. Admissions from 9th October 1916 – 31st December 1918 were 56,411. Discharges from 10th October 1916 – 31st December 1918 were 55,527. Remaining in the Hospital on 31st December 1918 were 884. The Australian Red Cross took control of the Red Cross Store in April 1917. Every patient able to walk visited the store and was issued with various items to add comfort to his stay. For patients unable to walk the shop visited them once a week to give them cigarettes and chocolate. Every patient was issued with 30 cigarettes a week. Many of the soldiers married Dartford girls. St Albans was the nearest church and lots of the weddings were held there. The hospital, even now, still gets enquiries from Australians looking into their family history. Later the Australian government presented the people of Dartford with a German Gun captured by the Australians. The inscription read ‘Presented to the people of Dartford by the Government of Australia in grateful appreciation of the kindness and hospitality extended to the Australian Soldiers of the 3rd Australian Auxiliary Hospital by the citizens of Dartford 1915-1919′. The gun was ‘sent for scrap’ during the Second World War when metal was desperately needed. After the war it was back to the occasional opening for epidemics of scarlet fever and diphtheria. Many hundreds of children from London were treated. Many of them travelled in the ambulance steamers, which must have been a unique experience for them. It remained mostly idle until 1939 when chronically sick patients were brought from the Midlands. After they had gone the Army took over. First an Officer Cadet Training Unit, who constructed an assault course and next a battalion of the Green Howards, finally a contingent of anti-tank gunners. Soon after D-Day these disappeared. The night they left a doodlebug landed on the east of the buildings, very quickly it became a blazing inferno, partly demolishing it. It was fully demolished some years later; the last few buildings were used as a pig farm for Joyce Green.